By Katie Akin, Lucia Geng, Amy Sherman on Thursday, August 2nd, 2018 at 10:21 p.m.
Tallahassee Mayor Andrew Gillum said he was the only one to call for Trump’s impeachment. Former Miami Beach Mayor Philip Levine ticked off Trump’s controversial 2016 election moments, while former U.S. Rep. Gwen Graham criticized Trump for "ripping babies out of the arms of mothers." Palm Beach billionaire Jeff Greene said he dissed Trump on TV and will work to undermine him — though businessman Chris King said Greene once called Trump a "great guy." The winner of the five-way Aug. 28 Democratic primary will face either U.S. Rep. Ron DeSantis, endorsed by President Donald Trump, or Agriculture Commissioner Adam Putnam. Voting by mail has already started and early voting begins mid August. The Democratic winner faces an uphill historical battle: The last time a Democrat won the governor’s seat was in 1994. U.S. Sen. Bill Nelson is the lone Democrat holding office statewide, and he faces a tough challenge from Gov. Rick Scott. The Democrats went after Scott’s two terms in office and explained what they would do differently on school funding and safety, guns, jobs, and the environment. But they weren’t always accurate in their attacks against Scott and each other. 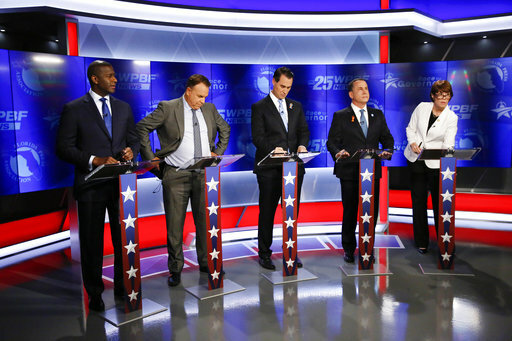 Jeff Greene: "We can’t have teachers with guns, like Rick Scott has proposed." Scott actually rejected the idea of arming teachers about a week after the shooting at Marjory Stoneman Douglas High School in Parkland. "I disagree with arming teachers. My focus is on bringing in law enforcement," Scott told reporters during a press conference. "Let law enforcement keep us safe and let teachers focus on teaching." Instead, Scott proposed adding at least one school resource officer for every 1,000 students in schools as part of his schools’ safety package. But in March, Scott signed a school safety bill that included allowing school personnel who voluntarily complete a marshal program to carry concealed weapons on campus, as well as adding restrictions on gun purchases. We tracked Scott’s campaign promise to increase school security funding and rated it Kept. Gwen Graham: "So I have found a public safety statute -- a Florida statute -- that allows the governor, whoever she is, to issue an executive order banning the sale of military style assault weapons." The statute doesn’t say the governor can ban military-style weapons if they want — it’s a lot more broad than that. As the follow-up question indicated, a legal challenge would undoubtedly follow. Graham cited Florida Statutes Section 14.022, which is about "emergency powers to quell violence," as the basis for her executive order. The statute says that the governor is "empowered to take such measures and to do all and every act and thing which she or he may deem necessary in order to prevent overt threats of violence or violence, to the person or property of citizens of the state and to maintain peace, tranquillity, and good order in the state, and in any political subdivision thereof, and in any area of the state designated by the Governor." Graham said she would get sued by the NRA. "Do you hear what I say? Bring it on," she said. Chris King: "I was stunned to read over the last few weeks that (Graham’s) company was building … the largest mall in the country, that will be a mecca for low-wage jobs, built on the edge of the Everglades." The American Dream Miami would include indoor roller coasters, a water park and an artificial ski slope. The primary developer for the project is Triple Five, but The Graham Companies own some of the land and will be developing around the area surrounding the new attraction. Graham’s family owns The Graham Companies, a real estate and agriculture developer. She was listed as a director for the company until 2015, when she left for Congress, according to a CBS Miami report. Most of her wealth comes from The Graham Companies. "Long before I announced that I was running for governor, I put everything in the appropriate type of trust," Graham said to CBS. "Everything that I have is behind a wall so that I will have no involvement in any of the projects that the Graham Companies do." The mega mall has been criticized because of its location near the Everglades and the thousands of tourists it would introduce to the area, causing traffic. Graham’s campaign told CBS that if elected, Graham would recuse herself if the matter ever came to a vote. Jeff Greene to Philip Levine: "When did you stand up to Donald Trump? When I was running for United States Senate in 2010 you gave money to Marco Rubio." Christian Ulvert, an advisor to Levine’s campaign, said that Levine "regrets his contribution to Sen. Rubio and believes he is a disappointment to Floridians" and said he helped raise millions of dollars to Democrats. A search of Federal Election Commission records showed that the bulk of Levine’s donations were to Democrats including Barack Obama in 2008, Hillary Clinton in 2016, as well as the Democratic National Committee. Chris King: Says Jeff Greene "called (Donald Trump) a great guy, who he was behind 100 percent." King is correct. Greene, a sharp critic now, expressed those sentiments on two different occasions. "He’s a great guy. I know Donald Trump," Greene said in a Fox Business interview the day after the 2016 election. And two days after the election, Greene wrote in a Forbes piece, "As a Democrat, I was fighting to see Hillary Clinton elected… At this point, my neighbor has won and I am behind him 100 percent as we all should be." Greene, who, by his own account, lives "two doors down" from Trump’s Palm Beach residence, rebutted King’s attack by saying he was calling for unity after the election. Jeff Greene: "The notion that Rick Scott created a million jobs or 700,000 jobs is ridiculous. He didn’t create any jobs." In interviews with reporters after the debate, Greene attributed any job increases in Florida to the Federal Reserve. When asked why he wasn’t counting jobs created by companies that Scott lured to Florida, Greene said that these weren’t high-paying jobs such as in the tech sector. He said that many of the jobs are low-wage jobs. Putting aside the issue of credit, the state added 1.49 million nonfarm jobs between the end of December 2010 and February 2018. So we rated Scott’s pledge to create 700,000 jobs Promise Kept. Andrew Gillum: "We know that Medicaid expansion and Medicare for All actually saves this state and this nation $2 trillion if it were fully implemented." There is something to what Gillum said: A new report from the Mercatus Center at George Mason University found the total amount of health expenditures would actually fall with a single-payer system proposed by Sen. Bernie Sanders, I-Vt., compared to what is expected under a continuation of the current system. The Mercatus report found total health care expenditures would fall by $2.054 trillion over 10 years. But there’s a catch — another estimate in the report offers a dimmer outlook. The alternative figure, which assumes that a Medicare for All plan isn’t as successful in controlling costs as its sponsors hope it will be, would lead to an increase of almost $3.3 trillion in national health care expenditures, not a decline. Chris King: "I’m the only one up here that opposes the death penalty in full." This is accurate. In a Medium post linked on his campaign site, King writes, "I strongly believe that one of the gravest stains on the moral character of our state is the continued use of the death penalty … I would pursue every avenue at my disposal to end this cruel punishment." Gillum said last year he was "not against" the death penalty, though he told CBS that he would suspend executions until the state examines the role that racial bias plays in the legal system. In an interview with the Tampa Bay Times, Graham proposed a restriction on the death penalty: state attorneys would need the opinion of a group of "in-house prosecutors" before seeking capital punishment. Levine’s campaign told the Palm Beach Post that the death penalty was an option "in certain and rare circumstances." Greene has not spoken publicly about his views on the issue, that we could find. Jeff Greene: "In this country today, we have 25 percent of the world’s prisoners and 5 percent of the world’s population." This is basically true. One large reason for large incarceration is that the United States has higher violent crime rates than most industrialized nations, leading to longer prison sentences, said Marc Mauer, executive director of The Sentencing Project, a group seeking to reform justice policies, in a previous fact-check. Another reason is that the United States tends to hand out longer sentences than other nations, he said. Andrew Gillum: "Starting salaries for teachers in the state of Florida is 45th out of 50 states." Gillum misspoke. The most recent data from the National Education Association shows that the starting salary for Florida teachers is $37,405. This is right at middle of the pack, just shy of the national average, $38,617. The average salary for teachers in Florida is $47,267, which is ranked 45th in the nation.